Welcome to this episode of the Real Fast Results podcast! 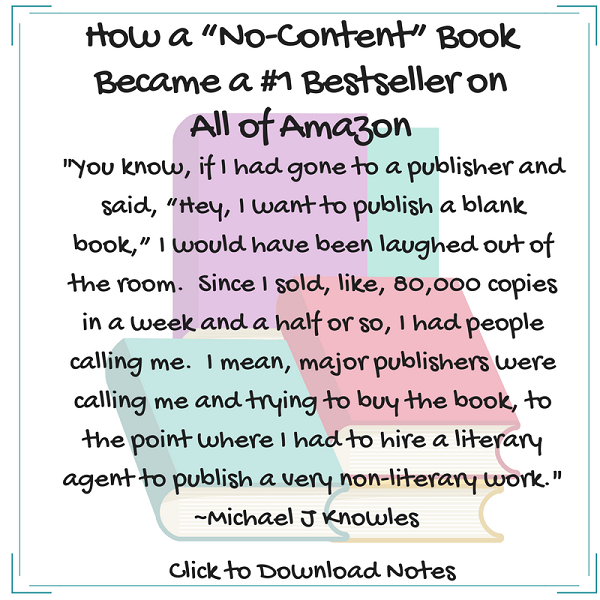 Today’s special guest is the infamous indie author and publisher Michael J. Knowles. He is a managing editor and cultural correspondent at The Daily Wire and a recent Yale graduate. In addition to that, he’s also a fine actor, but right now, he’s best noted as the author of Reasons to Vote for Democrats: A Comprehensive Guide. This book became a bestseller on Amazon, and not just a bestseller in one certain category, but the bestseller over all the books on Amazon. If you didn’t know, this is actually a gag book, filled with almost no content until you reach an extensive bibliography at the end. I wish there was some elaborate story about how I was going to market this thing & that I knew it was going to #1 Click To Tweet That really, wasn’t it. I thought it would be a funny gag. I was just sitting on the couch with my fiancé, and I said, “You know, there really ought to be…” And, by the way, this is an old gag. This gag has been around since at least 1880, which is when the Republican ticket of Chester Arthur and James Garfield published a blank book of their political opponent’s statesmanship and political achievements. Again, that was also republicans trolling democrats with this same gag. The best way is probably through Twitter. It’s @MichaelJKnowles, but I’m on every platform. You can find me on Facebook or on Twitter. I’m sure that you can find my email on a million pages that are out there. But, please do connect. This is one aspect I’ve really loved about this whole experience, and that is talking personally with people. It may take a while, but I’ll always get back to you. I’d love to hear everyone’s thoughts. It’s been a really fun and totally surreal experience for me, but the most amusing part is reading what everyone else is writing. I mean, those reviews on Amazon, and those Tweets, are really made up of some genuinely funny humor. So, send them at me because I look forward to reading them.